On October 31, 2012, at 11:41:18 AM Moscow Time, logistics spacecraft Progress M-17M was launched from the Baikonur launch site to the International Space Station. This story was updated at 9:40 a.m. EDT. A robotic Russian cargo spacecraft made a Halloween delivery today (Oct. 31) to the International Space Station. 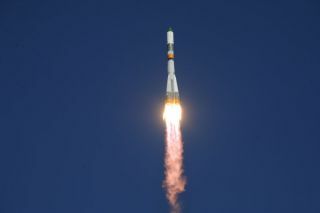 The unmanned Progress 49 spacecraft blasted off from Kazakhstan's Baikonur Cosmodrome at 3:41 a.m. EDT (0741 GMT) today, carrying nearly 3 tons of supplies for the orbiting laboratory. It arrived roughly six hours later, docking at 9:33 a.m. EDT (1333 GMT), as the two vehicles were roughly 250 miles (400 km) above Bogota, Colombia. Progress 49 is toting 2.9 tons of supplies, including 2,050 pounds (930 kilograms) of propellant, 926 pounds (420 kg) of water, 62 pounds (28 kg) of oxygen and 2,738 pounds (1,242 kg) of spare parts, NASA officials said. There's no word yet on whether any candy corn or miniature chocolate bars made it onboard to help the space station's six astronauts celebrate the season. Life on orbit is always busy, but this week is particularly jam-packed for station crew. For example, today's launch comes just three days after SpaceX's unmanned Dragon capsule left the station, wrapping up the first-ever commercial cargo mission to the $100 billion orbiting complex. Dragon splashed down in the Pacific Ocean off the Baja California coast on Sunday afternoon (Oct. 28). Dragon will make at least 11 more flights to the station under a $1.6 billion contract that California-based SpaceX signed with NASA. Its next launch is currently scheduled for January, agency officials have said. Dragon is unique in its ability to ferry hardware, supplies and scientific experiments both to and from the space station. All other cargo craft currently operating — including Russia's Progress ships — carry supplies to the orbiting lab but burn up upon re-entering Earth's atmosphere. Shortly after welcoming Progress 49 to the station, crewmembers will turn their attention to another task. NASA astronaut Sunita Williams, commander of the orbiting complex's current Expedition 33 mission, and Japanese colleague Akihiko Hoshide will perform a spacewalk Thursday morning (Nov. 1). Beginning at 8:15 a.m. EDT (1215 GMT) Thursday, Williams and Hoshide will venture to the port side of the station's backbone-like truss to repair an ammonia leak in a radiator. The spacewalk should take about 6 1/2 hours, NASA officials said.